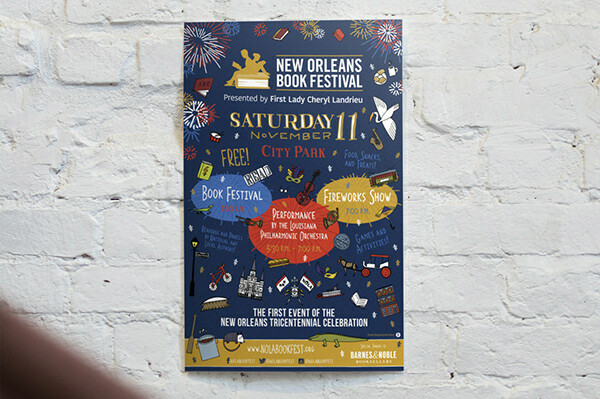 Julia has been working in some capacity on the print collateral for the New Orleans Book Festivalsince 2012, a relationship which eventually grew into her being responsible for the festival event brand design and the majority of collateral execution in 2016. This year, we faced an interesting challenge that came attached to a huge honor. New Orleans is just weeks away from a monumental milestone: in 2018, it will have reached three-hundred years since its founding. 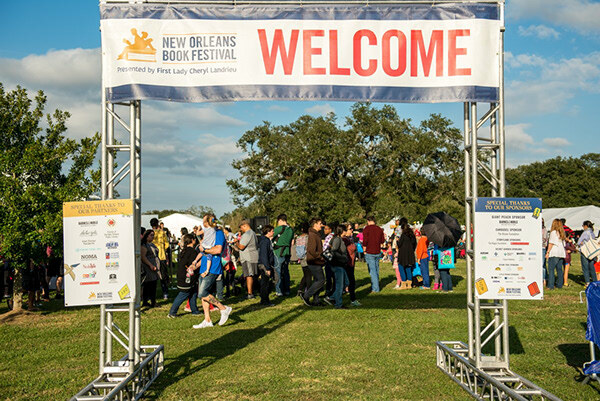 The City has planned a yearlong bonanza of celebrations and historic projects, of which the 2017 New Orleans Book Festival was selected as the first official event. Our challenge? 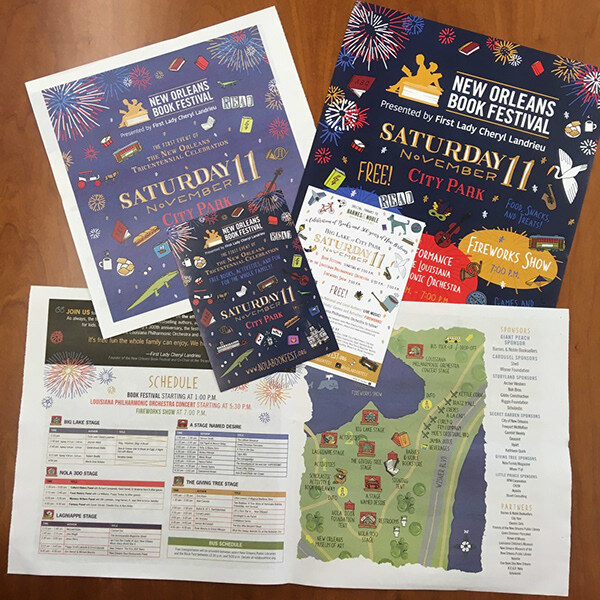 The client wanted to continue using many of the art elements and visual style from the illustration-based branding of 2015 and 2016, but to also shift the palette toward that of the official Tricentennial Commission branding, and put the focus of the illustrations on New Orleans’ history and musical heritage, as well as highlighting the extravagant fireworks and live orchestra that would close out this year’s festival for the first time. 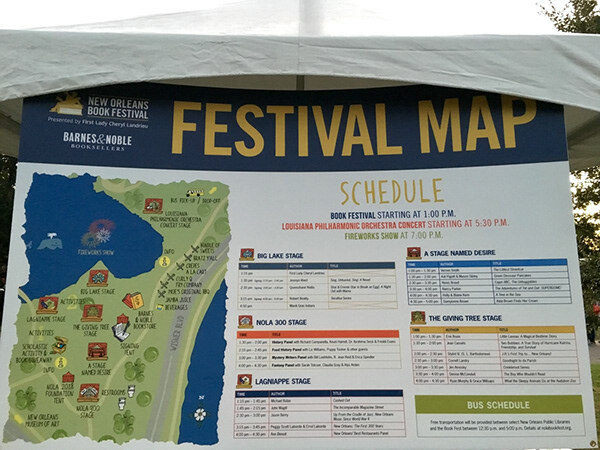 Julia created dozens of new illustrations of New Orleans’ most beloved architecture, instruments, and monuments, plus new title lettering modeled after hand-lettering samples from the early 18th century (circa when New Orleans was established). Navy proved the perfect backdrop for her fun fireworks art, which exploded across everything from bookmarks to banners. 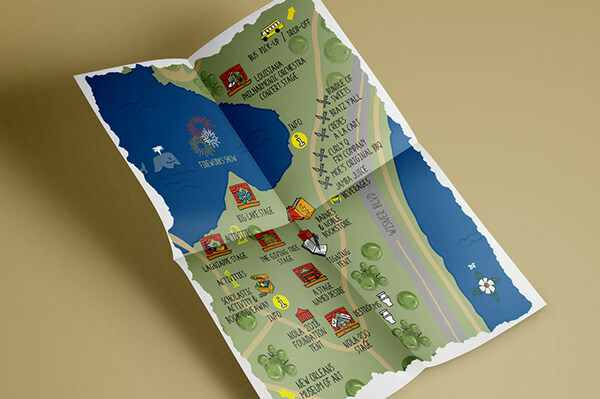 Keir tapped his map-making powers to revamp the festival map so everyone could see their way to free books and a grand community celebration. The dozens of deliverables were tracked and shared through a shockingly simple collaborative spreadsheet in Google Docs. 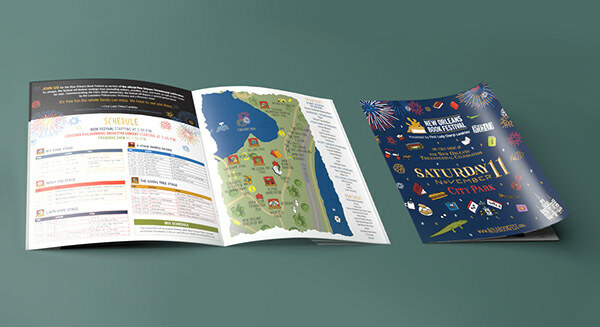 Festival event brand design identity illustration and collateral production across multiple print and digital media for a yearly family-friendly event.